A Gold Line test train heads over the eastbound 210 toward Arcadia Station. The tracks looking east from the current Gold Line terminus at Sierra Madre Villa Station in Pasadena. A Gold Line test train crossing the new bridge over the San Gabriel River between the Duarte and Irwindale stations. A view of the Arcadia Station and new transit plaza. Then & Now: A streetcar in Arcadia near the new 1st and Santa Clara crossing in Arcadia. Streetcar photo by Alan Weeks. A closer look at the new plaza at Arcadia Station. A platform at the downtown Azusa Station with the new city and transit parking garage in the background. A Gold Line test train at Downtown Azusa Station. A light rail car at the new maintenance campus in Monrovia. The Citrus College/APU Station in Azusa is a short walk to the schools and the new Rosedale Development. The parking garage at the Citrus College/APU Station. The view from Highland Avenue looking west toward the Duarte Station. Another view of the Duarte Station, which is a short walk to the entrance to the City of Hope campus. The Irwindale Station and a test train with the 210 in the background. The Monrovia Station is adjacent to a public plaza, new parking garage and a future residential and commercial development. The platforms for Monrovia Station and the new parking garage. An aerial view of the new rail yard in Monrovia. Inside the new maintenance campus. Then & Now: a streetcar crossing the San Gabriel River and the new Gold Line bridge. Streetcar photo by Alan Weeks. Part of the Gold Line project involved moving the freight track still used that is west of Duarte. All photos by the Gold Line Foothill Extension Construction Authority. Click on a photo to see a larger version. Metro CEO Phil Washington announced Thursday that the Gold Line Foothill Extension will open on March 5. This is huge news for cities along the San Gabriel Mountains — Arcadia, Monrovia, Duarte, Irwindale and Azusa — who pushed for years to get the project funded and built as a transit alternative to often clogged 210 freeway and other major roads in the area. This will be the first Metro Rail project to open that was funded by Measure R, the half-cent sales tax increase that was approved by 68 percent of Los Angeles County voters in 2008. The next Measure R rail project to open — also next year — will be the second phase of the Expo Line between Culver City and downtown Santa Monica. Until the Gold Line opens to Azusa, Metro will be testing rail systems and new light rail cars, training operators and staffing the new rail yard in Monrovia. There will also be extensive community outreach to ensure pedestrians, cyclists and motorists act safely around the new line. An independent agency, the Foothill Gold Line Construction Authority, planned and built the project, which was handed over to Metro in late September. Metro extends a big congratulations to Authority staff and the many women and men of the three primary contractors who built the rail line, new rail yard in Monrovia and the parking structures. The Gold Line Foothill Extension extends the Gold Line for 11.5 miles from the current Sierra Madre Villa Station in eastern Pasadena to the Azusa/Glendora border. The project includes 24 bridges and 14 street-level crossings. There will be six new stations: downtown Arcadia, Monrovia, Duarte/City of Hope, Irwindale, downtown Azusa and APU/Citrus College Station in Azusa. APU is Azusa Pacific University. It will take about 50 minutes to travel on the Gold Line between Los Angeles Union Station and the the APU/Citrus College Station in Azusa. Trains will run every 12 minutes during peak hours between Sierra Madre Villa and Azusa; service will remain every six minutes between Union Station and Pasadena. There will be parking at each of the new six stations: 300 spaces in the new garage at Arcadia, 350 in the new garage at Monrovia, 125 in a parking lot in Duarte, 350 in a parking garage in Irwindale, 200 spaces in a new garage shared with the city of Azusa and Foothill Transit in downtown Azusa and 200 spaces at the APU/Citrus College Station. 5. Riding will cost $1.75 for those paying the regular fare, which includes two hours of free transfers. Metro daily passes cost $7, weekly passes $25 and monthly passes $100 for those using TAP cards. There are discounts available for K-12 students, college/vocational students, seniors, the disabled, Medicare recipients and eligible low-income riders. Please see this web page for more information about discounted fares. The project includes a new 24-acre rail car maintenance facility in Monrovia that can hold 84 rail vehicles and will be a major employer in the area. The Gold Line Foothill Extension cost $957 million, including the new tracks, the rail yard, parking facilities and amenities to help pedestrians and cyclists reach the stations and garages. 8. The Foothill Gold Line Construction Authority was set up by the state to plan, design and build the Gold Line from downtown L.A. to the San Gabriel Valley. The Construction Authority also built the 13.5-mile DTLA to Pasadena segment. Metro built the Eastside Gold Line project between Union Station and East L.A.
9. The Construction Authority has completed environmental studies for a second phase to the project that would extend the tracks from Azusa to Montclair in San Bernardino County. The L.A. County portion of that segment is in Metro’s current long-range plans but is not yet funded. San Gabriel Valley officials have submitted it as a project possibly to be funded by a potential Metro sales tax ballot measure in Nov. 2016. A portion of the project between Claremont and Montclair would have to be funded by San Bernardino County. The latest info is here about the long-range plan update and possible ballot measure. 1o. The Regional Connector project is tying together the Blue, Expo and Gold Lines in downtown Los Angeles. When completed, Gold Line riders from Azusa and East Los Angeles will be able to travel to the heart of downtown Los Angeles without having to transfer to the Red/Purple Line subway at Union Station. More on Regional Connector here. Today Phillip A. Washington, CEO for the Los Angeles County Metropolitan Transportation Authority (Metro) announced that the Metro Gold Line Foothill Extension Project, the very first rail line funded and built thanks to the 2008 Measure R countywide sales tax, will officially open to the public on Saturday, March 5, 2016. The $1 billion project will extend the Metro Gold Line from its current terminus at Sierra Madre Villa Station approximately 12 miles east to Azusa, with new station stops at Arcadia, Monrovia, Duarte/City of Hope, Irwindale, Azusa Downtown and APU/Citrus College. The line is anticipated to carry 13,600 riders on a daily basis, with trains operating every 12 minutes during peak hours. 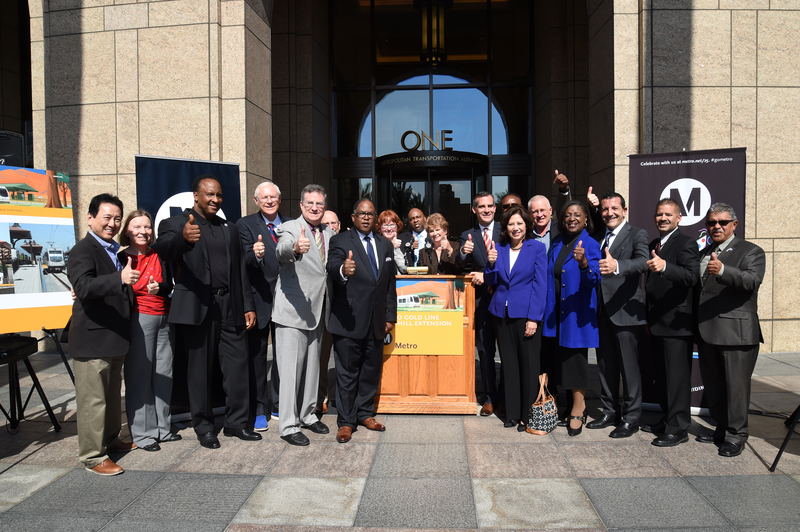 The Metro Board of Directors and San Gabriel Valley officials at the announcement on Thursday at Metro HQ. Photo: Luis Inzunza/Metro. The rail extension was built by the Metro Gold Line Foothill Extension Construction Authority, an independent transportation planning and construction agency. The line took five years to build, with major construction completed in September 2015. Metro has now accepted delivery of the rail line extension, and will require the next several months to complete rigorous pre-revenue service to ensure the line is safe and ready for operation. This precursor work is critically important for the successful launch of the rail line. Metro is testing the line, training operators, supervisors and maintenance personnel, and will conduct extensive community outreach to help keep pedestrians, bicyclists and motorists safe around passing trains. For example, Metro will test its fleet of brand new Kinkisharyo train cars as part of its pre-revenue service operations. The brand new P3010 train cars will seat 68 passengers and are highly advanced stainless steel vehicles specifically designed to support Metro’s complex system expansion needs. Metro has already begun operating several Kinkisharyo test trains on the alignment, and will accelerate train testing in preparation for the opening. New rail cars must be tested and run through a “burn-in” process, with each car needing to run on the tracks for 1,500 miles. In addition to the trains themselves, Metro also will test 23 miles of new train track. Tracks traverse 24 bridges and 14 at-grade street crossings. Metro must also test power and substation components in a simulated revenue service environment. Integrated testing will ensure that all systems, from power, communications, signals, and grade crossings are all operating successfully. What’s more, on July 24 of this year, Metro accepted the new $265 million 24-acre operations facility in Monrovia that will house up to 84 light rail vehicles. Nearly 200 employees are scheduled to work at this single facility that will operate on a 24/7 basis. During these pre-revenue testing and training operations, the public is advised to “Stop, Look and Listen” as test trains begin moving regularly through San Gabriel Valley communities for the very first time. Motorists are encouraged to be alert and watch for the presence of trains. Drivers should keep clear of closed crossing gates and look both ways before crossing the tracks. Pedestrians, bicyclists and motorists should adhere to all posted “No Right Turn on Red” signs. Metro has posted 24 safety ambassadors along the alignment from 6 a.m. to 6 p.m. Monday through Friday to help people cross safely. Ambassadors are retired bus and rail operators who are fully trained in safety rules and regulations. They will assist pedestrians, bicyclists and motorists at crossings, answer safety questions, observe unsafe situations and report safety-related issues to the agency. 12-minute peak-hour frequency? It’s currently 6 minutes on the Gold Line. Are they planning on turning half the trains around at Sierra Madre Villa or something, or are they actually cutting service to Pasadena? Rail operations says six minute headways between Union Station and Pasadena and 12-minute headways initially on the new segment of track between Pas and Azusa. Sorry for the confusion! Got it… so my guess of turning around half the trains at SMV is probably not too far off the mark. Thanks for the clarification. Can you clarify that further? Will the turn-around for the Pasadena trains be at Sierra Madre Villa, or at one of th other Gold Line stations in Pasadena? Or will the new segment of track between Pasadena and Azusa be served by a separate route, with passengers forced to transfer at Sierra Madre Villa? This is an exciting time for Metro and everyone in the county. Can’t wait for this to open. I was there at the announcement. If the Regional Connector is built, it won’t just be DTLA that the Gold Line riders from Azusa (or from Montclair when Phase II of the Foothill Extension is built) can get to. They can go all the way to Santa Monica or Long Beach for only $1.75. That’s over 40 miles to travel Santa Monica to APU, or almost 50 miles from Santa Monica to Montclair for $1.75. All the while it’ll cost the same $1.75 to go to the neighborhood supermarket. At this rate of expansion, the existing flat rate fare system will become unsustainable without further fare hikes, which will only benefit the long distance riders, but further hurt the majority of low income short distance riders. We need to be looking at moving to distance based fares now before the Regional Connector opens. No you can’t. Transfers are only free if you can manage to do it within 2 hours, and since the Expo Line today only goes to Culver City, you still have to transfer to Santa Monica Big Blue bus thereafter which isn’t part of Metro’s free transfer plan. The Gold Line only goes to Sierra Madre Villa today, with transfers to the Red/Purple Line needed at LAUS and another transfer needed at 7th/Metro to the Expo Line to get to Culver City. We’re still not there yet with opening of Expo Phase II to the Santa Monica terminus, so you’ll still need to transfer to the Santa Monica Big Blue Bus 20 after Culver City which adds another $1.00 to the transfer as TAP can’t yet figure out how to automate Metro-to-Muni transfers. With maintenance issues these days, a delay on the Gold Line can easily waste 30-40 minutes just standing at the station not moving and adding the ride time, you may or may not make it to the next transfer within the 2 hour window. You can go from the end of the Gold Line to Long Beach for $1.75 today. Only difference is the Gold Line will go a little farther in a few months. You can ride from Long Beach to Chatsworth on $1.75. Why aren’t you complaining about that? But imagine that Foothill people riding long distance… Gotta charge ’em more, right? Nope. My content is that anyone who has a longer distance trip should be charged more, not exclusive to just those who live in Azusa and have a need to go to Santa Monica. If someone lives in the San Fernando Valley and wishes to go all the way down to Long Beach or even Disneyland via Metro Bus 460, they should be paying more for that longer distance trip. What is different however, is that once the regional connector is built, it becomes a single seat ride that extends over 40-50 miles from Santa Monica to Azusa (or Montclair). There will be no transfers involved and inevitably, that creates a very distorted fare scheme we have here in LA where along that completed line, it’ll cost $1.75 for a single seat ride from Santa Monica to Azusa, while also costing $1.75 from Santa Monica to Culver City. You’re free to argue however you like, but former Metro CEO Art Leahy was the one who pointed this out this March that in his own words, he said “it is more imperative to start looking at distance based fares” before the Regional Connector is built. This comment thread is for a discussion of the Foothill Gold Line. Your point about distance-based fares has been made. There have already been many, many, many, many long comment threads on The Source about distance-based fares and I’m sorry, but I’m not going to allow this thread to turn into another distance-based fare discussion as there is nothing imminent on that front. There’s plenty to talk about in regards to this project. That is 1st quarter 2016! The Construction Authority said 1st half. And it is not even Spring 2016, which is what MTA has been saying. Let the design-build contract for the next phase start now! The street car then and now pic: the street car line is actually North, on the other side of the 210 freeway. The gold line bridge is not the same site as the street car image. The street car (pe) bridge is still intact is being used as a bike / jogging trail. Wow, another complete waste of taxes of building another train to nowhere, thanks to Metro. The pictures are great. How are they taken? A drone perhaps? Metro still has addressed the issue of which bus routes to serve which new station. Those details have to be released soon so that the general public can provide suggestions to this issue. This is a great additon to the rail network but simply running too slow. Metro needs to figure out some sort of express service to make transit in LA more enticing than car. The nature of the LA basin is unfortunately sprawling. In order to have express service, the tracks need to be doubled on each side in order to overtake the regular service trains. That usually means more taxes needed in order to upgrade every single station and every other rail tracks that are currently in service. Why Metro didn’t do this from the start is of course, anyone’s guess. But then again, Metro usually has a problem with thinking in long terms scenarios. Look at the Expo and Blue Lines with their at grade crossings that delay everything near DTLA for example. Free storage of private automobiles is the real opiate of the Masses! Free storage of private automobiles is costly to taxpayers and instead, should be done with a public-private partnership with a profit oriented parking lot operator. 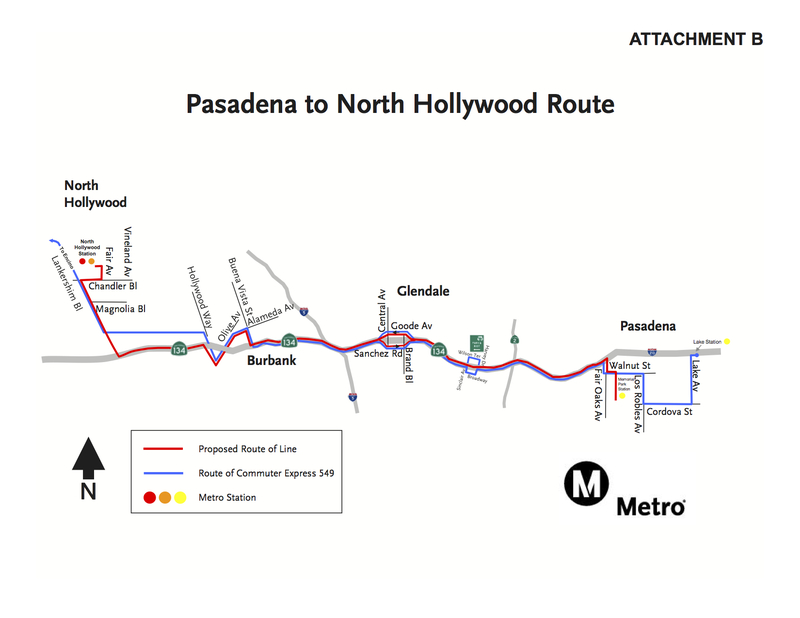 Why won’t the Pasadena-NoHo bus line stop in Eagle Rock? Exit the 134 onto Colorado Blvd, stop at Eagle Rock Blvd/Colorado Blvd, then get back onto the 134 in Glendale. Each added stop will add time for the bus. It seems the purpose of the bus is to provide a quick way for residents of either SFV or SGV to get to a job in the Burbank Media District with just one transfer. Orange Line riders can transfer at NoHo. Gold Line riders can transfer at Memorial Park. The fact that the bus can also be used as a connection between the Orange Line and the Gold Line is nice, but I don’t think most passengers will use this bus end to end. There are enough jobs in Glendale to merit a quick get off the freeway and stop, but probably not enough jobs in Eagle Rock to merit the same consideration. The purpose of the new bus is to provide a better connection between the Orange Line and Gold Line and to connect both lines to the major employment center known as the Burbank Media District. Each additional stop will add a lot of time to the line. Downtown Glendale has enough jobs to merit a quick get on / get off stop, even though it will add time, but Eagle Rock does not. Will the Gold Line have a connection to Cal State LA leaving from Duarte? I get that there aren’t many jobs in Eagle Rock but a lot of people in Eagle Rock work in Glendale, Burbank, and Pasadena. Right now folks in Eagle Rock would like to take transit to Glendale and Burbank but there is not fast transit option. The 780 is a decent option if going to downtown Glendale but otherwise isn’t of much help. The real obstacle I see is if the bus gets off the 134, the traffic around the Glendale 134 on/off ramp on Harvey can be a pain at any hour of the day, especially rush hour. Other than that, I see no harm in an Eagle Rock stop. Wonderful news! I can’t wait until the other half of this extension is finished. Next stop: Claremont! I am from toronto with the best transportation system in the world. Now it is Los Angeles turn to catch up! I wouldn’t consider Toronto TTC to be the “best in the world” when a single ride costs CAD 3.00 regardless of distance. You do have an impressive 73% farebox recovery ratio however, but at what cost? Your city council disregards all the scientific evidence that your constant flat rate fare hikes are continuing to hurt the poor. That being said, Toronto is hardly a role model for Los Angeles. No one here is going to ride Metro if we follow your model of jacking up fares to $3.00. We already have lower ridership numbers due to raising the fares to $1.75. Toronto is still the best if you compare the fare in Paris at Euro3.6 flat per ride for any distance. Not to even mention the one in London! Now we need to know when the Expo Line will make its auspicious debut. I am now betting on late April or May. Sorry wrong one. Other states are copying us. This is the Gold Line March 5, 2016. When will Metro complete the passageway under Lankershim Blvd so Orange Line riders can access the Red Line NoHo station without crossing the street? The project is currently scheduled for construction to be complete in May 2016. Now that the Gold Line Foothill Extension has an actual opening date, when will Expo Line Phase 2 to Santa Monica announce their opening day? My best guess is that we’ll get an announcement after the project has been successfully handed over from the Construction Authority to Metro. When will pre-revenue of the foothill extension start? 1. Along the rail pass, please make sure you plant only drought resistant plants like ice plants and bougainvillea.They are beautiful and use little water after they are established. 2. The parking space in stations like Villa in Pasadena, Culver city and La Cienega (I’ve been to these three stations only)are not sufficient to accommodate passengers. There were a few times, we couldn’t find a parking space. If you wish to encourage people to use metro train but people can’t find a parking space or even worse if you set any limit on parking hours, that will only make the situation worse. Please built a bigger structure with plenty of parking space and don’t limit the parking hours unless people leave cars there for more than 1/2 months. People should be able to leave the car there for at least a week if they need to. 3. It would be a good idea to have police and security people around at least randomly at each station for security and free riders. 4. Do not allow people to eat or drink in the train. This rule must be strictly enforced since the beautiful interior in the train has been damaged. Thanks. It’s a wonderful project and I love riding it.